Deadline sale closes 19th December. Expressions of interest to office@anglicanweb.org. There is a reserve of $500 on the original art work. The original artwork is on display in St John’s Anglican Church, 353 High Street, Rangiora. 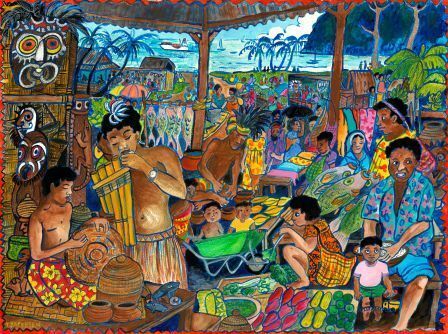 The work is designed from the artist’s memories of a visit to the colourful, busy Lae Markets in PNG. She was able to go to PNG by accompanying her husband Peter, on the Forum New Zealand, which was a small container vessel that visited PNG and some Pacific Islands as an aid project to the region partly sponsored by the New Zealand Government in the 80’s and 90’s. The work is gifted to Anglican Life Rangiora, to assist the church with its work supporting mission overseas. One area in particular that the parish supports overseas is the Dioceses of Kondoa in Tanzania. The people of this Parish generously raised $5000 to help the people of Kondoa survive. People may still donate any amount to this cause details of how are on the church’s web site. The Bishop of Kondoa; Bishop Given Gaula, is finishing his PHD in Auckland in December and will visit the parish. Trisha Jacobsen is a New Zealand artist who primarily paints, illustrates with some amateur photography. She also does 3 D work in multimedia and painted ceramics. She is an active Christian and member of Anglican Life Rangiora. Born in Scotland she was raised and educated in Auckland (Northcote College), a graduate of North Shore Teachers’ College in Art Education, and Auckland University majoring in Art History and Maori Politics. Her initial period of teaching was Art at intermediate schools and secondary schools including Northcote College where she was a former pupil. She has had tuition under Louise Henderson, Dugald Page, Don Binney, Chester Nealy, Patrick Hanly, Carole Shepherd and Stanley Palmer. She has exhibited in Wellington and in Auckland in group and individual shows and was member of the Auckland Society of Arts, an active member of the Women’s Artists Association in Auckland and worked as a consultant to private art galleries in Brisbane before moving to Gladstone in 1996. Due to her husband’s work in shipping the family went to Australia in 1988, where she continued teaching in Secondary Schools, art gallery consulting work and then teaching and working in TAFE plus continued with her art work in Queensland. She gained further post grad qualifications including her Masters in Art Therapy. She exhibited in Gladstone at the Gladstone Regional Gallery, Toondoon Gardens Gallery and The Potters Place, was in group and individual shows and was the art teacher at Chanel College. Trisha has won minor art awards and her work was selected many times to represent the Gladstone Region in Japan. Now retired from teaching she has returned to her homeland, New Zealand and resides in Rangiora. Trisha has art works in private, regional and international collections. She works in themes and did quite a few satirical political works and social commentary in the 1980’s. A few New Zealanders to have her work include, Marilyn Waring, Helen Clarke, the late Sir Robert Muldoon, and David Lange, Jim McLay among many others, plus her works are in Westbury/ Tasmania, Scotland, Germany, England, Brisbane, Sydney, Melbourne, Gold Coast, Sunshine Coast, widely in Auckland, and throughout the Gladstone Region and now in Christchurch. She has now begun her studio “Dada. Blu Donki” at 29 King St, Rangiora. She tutors, teaches, is an art therapist and an active working exhibiting member of the Rangiora Art Society. She is able to undertake commissions, pet-ographs, murals, design and illustration work and help clients chose works of art suitable for their interiors and exteriors. She primarily works in painting and drawing, in acrylics/oils and with ceramic plates and platters.